VideoSolo Video Converter Ultimate allows you to convert almost all existing formats, including AVI, FLV, MP4, M4V, MKV, MOV, 3GP, 3G2, SWF, WMV, ASF, AAC, AC3, AIFF, FLAC, M4A, MP3, OGG, WAV, WMA and more. When you are reviewing captured video, how often do you feel that it cannot meet the quality you expected. Too dark? Overexposed? Shaking video? Don't worry, the built-in video enhancer can improve your video quality easily. With the built-in video editor, you are allowed to edit your videos basically. 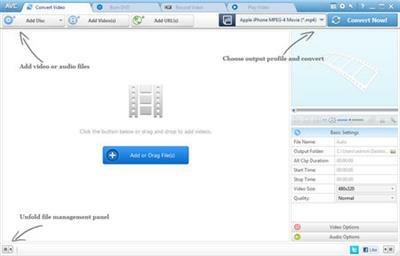 On its editing window, the editing features such as crop, clip, watermark and effect are offered. With VideoSolo Video Converter Ultimate, you can throw all those incompatibility issues away and convert almost any video to the video format that preset for your iPhone, iPad, Android phone, PS4, Smart TV, etc. It supports HD/4K UHD and 3D conversion. You can take full control of the conversion of 4K (UHD), 1080P (FHD), 720P (HD) and 480P(SD). Better yet, you can rip homemade DVD to MP4. Thanks to the Support of NVIDIA CUDA, NVENC, AMD and Intel HD Graphics hardware acceleration technology, the conversion speed is 6 times faster than normal. No re-compression or loss of quality!